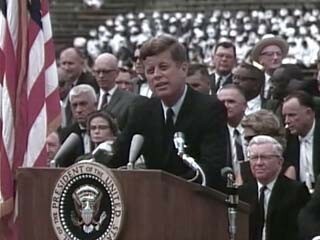 John F. Kennedy’s legacy is a vision of political action and public service based on courage, service, inclusion, and innovation. We will send Americans abroad who are qualified to do a job. We will send those abroad who are committed to the concept which motivates the Peace Corps. How many of you who are going to be doctors, are willing to spend your days in Ghana? Technicians or engineers. How many of you are willing to work in the Foreign Service and spend your lives traveling around the world? On your willingness to do that, not merely to serve one year or two years in the service, but on your willingness to contribute part of your life to this country, I think will depend the answer whether a free society can compete. I think it can! And I think Americans are willing to contribute. But the effort must be far greater than we've ever made in the past. To those people in the huts and villages of half the globe struggling to break the bonds of mass misery, we pledge our best efforts to help them help themselves, for whatever period is required. Use the links below to discover more about President Kennedy and public service. We must all, in our daily lives, live up to the age-old faith that peace and freedom walk together. In too many of our cities today, the peace is not secure because freedom is incomplete. Today I may be the victim--but tomorrow it may be you--until the whole fabric of our harmonious society is ripped apart at a time of great national peril. One hundred years of delay have passed since President Lincoln freed the slaves, yet their heirs, their grandsons, are not fully free. They are not yet freed form the bonds of injustice. They are not yet freed for social and economic oppression. And this nation for all its hopes and all its boasts, will not be fully free until all its citizens are free. It seems to me that these are matters which concern us all, not merely Presidents or Congressmen or Governors, but every citizen of the United States. 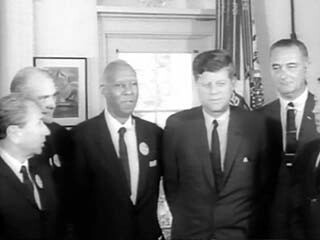 Use the links below to discover more about President Kennedy and civil rights. What kind of peace do I mean? And what kind of a peace do we seek? Not a Pax Americana enforced on the world by American weapons of war. Not the peace of the grave or the security of the slave. I am talking about genuine peace, the kind of peace that makes life on earth worth living, the kind that enables men and nations to grow and to hope and to build a better life for their children-not merely peace for Americans but peace for all men and women-not merely peace in our time but peace in all time. For peace is a process-a way of solving problems. Let us call a truce to terror. Let us invoke the blessings of peace. And as we build an international capacity to keep peace, let us join in dismantling the national capacity to wage war. 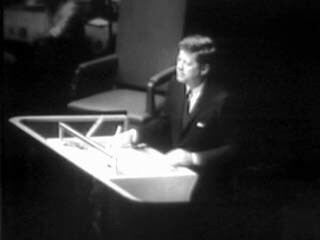 Use the links below to discover more about President Kennedy and peace and diplomacy. To the extent that artists struggle to express beauty in form and color and sound, to the extent that they write about man's struggle with nature and society, or himself, to that extent they strike a responsive chord in all humanity. Behind the storm of daily conflict and crisis, the dramatic confrontations, the tumult of political struggle, the poet, the artist, the musician, continues the quiet work of centuries, building bridges of experience between peoples, reminding man of the universality of his feelings and desires and despairs, and reminding him that the forces that unite are deeper than those that divide. 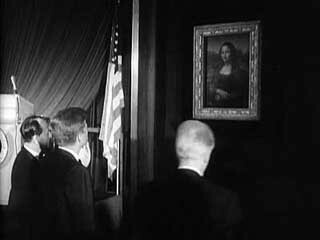 Moreover, as a great democratic society, we have a special responsibility to the arts, for art is the great democrat calling forth creative genius from every sector of society, disregarding race or religion or wealth or color. The mere accumulation of wealth and power is available to the dictator and the democrat alike. What freedom alone can bring is the liberation of the human mind and spirit which finds its greatest flowering in the free society. Robert Frost said it: Two roads diverged in a yellow wood, and I- I took the one less traveled by, and that has made all the difference. Use the links below to discover more about President Kennedy and arts and culture. Now it is time to take longer strides--time for a great new American enterprise--time for this nation to take a clearly leading role in space achievement, which in many ways may hold the key to our future on earth. We go into space because whatever mankind must undertake, free men must fully share. The survival of the man who first makes this daring flight, but in a very real sense, it will not be one man going to the moon--if we make this judgment affirmatively, it will be an entire nation. For all of us must work to put him there. 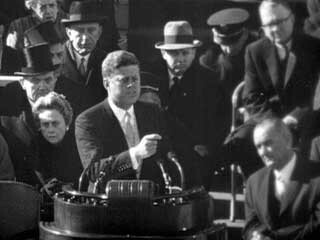 Use the links below to discover more about President Kennedy and science and innovation.